Indian American Senator Kamala Harris rallied a crowd of hundreds of thousands of mostly women on the Mall in Washington, urging them to return to their states and get involved in the political process to protect women’s rights. In an impassioned speech Jan. 21, the day after Republican President Donald Trump was sworn into the Oval Office, Harris harked back to the 1960s when her Indian-American mother and Caribbean-American father met during the civil rights movement. This time is |similar to when my parents met when they were students at the University of California … in the 1960s,” Harris said. She called it a pivotal moment in the history of the country. “We are a great country,” Harris said. “We are a nation founded on certain ideals,” laid down in 1776, “that we are all, and should, be, treated as equals; that we have the right to worship freely and wihtou intrusion; where immigrants represent the heart and soul of what it means to be an American,” Harris said to bursts of applause and shouts from the massive crowd which turned out to be close to half a million, according to news reports. “You have the power and we the people have the power … and there is nothing more powerful than a group of determined sisters, … marching with their brothers and father,” Harris said. Harris noted that every position she was elected to over her career, was one where she was the first woman to do so. That is the case with her position as the first Indian-American Senator of California, after serving as the first woman Attorney General of her state. Good paying jobs, immigration reform, student debt, and Black Lives Matter were all women’s issues. “We deserve a country with equal pay … and the right to abortion as a fundamental right,” Harris. It was time to end the relegation of women to a particular demographic, she said. 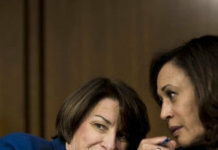 “Let’s buckle in because it is going to be a bumpy ride,” Harris said.